There are a variety of colour themes floating around in blogland at the moment, Project Spectrum, Colour Week, Color-iffic Swap-o-rama and the Flickr group Catchy Colors has some great colour themed groups too. But I just find myself having periods of time where I’m obsessed, for want of a better word with a colour. It was red and now it’s green. Some of the things I’ve been making have been for gifts but now I’m getting so fond of it that it seems to be taking over every project! I told you I’d started another one….the colour is a bit washed out. 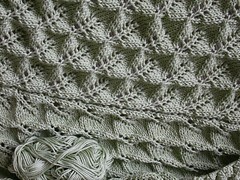 10 pattern repeats down…..lots to go.